I love the opportunity of researching and sharing Portuguese traditions, I love your kind comments and the mails I've been receiving. And I loved the coincidence of my birthday falling on a Thursday... So I decided to celebrate it properly... And I'll do it sharing my joy with you. I believe that a giveaway is a nice way of doing it. Don't you think? Let's do it as if you were going shopping. I invite you to visit my agulha não pica ETSY shop. There you can browse my Embroidery Kits, Patterns or children burlap embroidery kits sections (and all the others obviously). Choose your favorite product and write its name on a comment to this post. That way you'll be applying to win it! You can choose one of my beginner kits inspired by Portuguese traditions, like the ones with a heart or a Japoneira inspired by Viana do Castelo embroidery or the other one with a paisley pattern. All my beginner kits come in beautiful drawstring bags, taleigos. 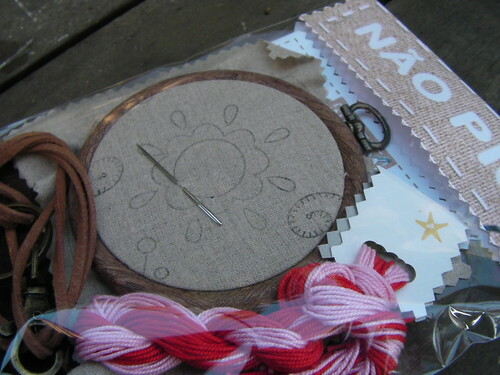 You may prefer an embroidery kit that comes with all the material and instructions to make your own embroidered pendant that you can use in a necklace or in a keyring. Or is it better for you to choose a new kit that just arrived in my Etsy shop? Made of Portuguese felted wool, this kit will allow you to make a wonderful book cover embroidered with a Portuguese traditional motif. It comes with all the material needed and step by step instructions. All these products were created by me using Portuguese supplies and inspired by Portuguese traditions that I bring here each week. 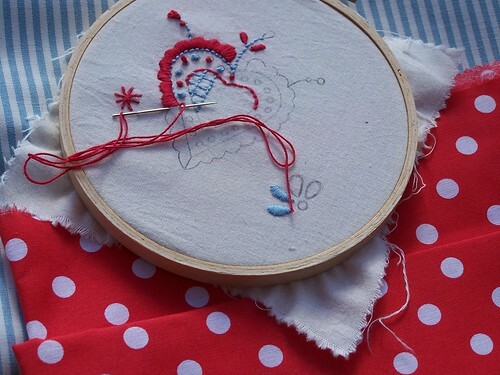 It's your opportunity to make your own stitches with Portuguese soul. So... Don't forget to leave a comment on this post with your favorite product from agulha não pica shop. There will be two lucky winners... And they will receive their favorite product. They will be randomly picked from all the comments. But if you want to make a general comment about the shop, you'll be applying to a special Christmas gift, too. In that case I will choose my favorite comment. Write your favorite product and a comment about the shop and you'll be applying to win both gifts! Comments will be closed on 9 PM Nov.18, U.S. CST and winners will be announced next Thursday. And to all of those celebrating their anniversary today: PARABÉNS! 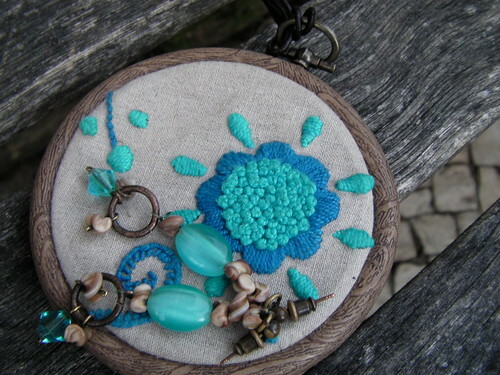 I am really diggin' the DIY Embroidered pendant for necklace or key-ring. Very cool! http://www.etsy.com/listing/98789963/burel-andor-cork-leather-cork-fabric This is my favorite. thanks for the chance! My favourite thing in your shop is the embroidery kit with the paisley print - I LOVE paisleys. I love the variety of pretty colours you've used with the different kits. Actually, that's something I like about all the things in your shop - nice bright colours and it's all sort of interchangeable, it doesn't seem like anything has to follow colour rules in order to look good. What a unique selection of embroidery items you have! I'd be interest in the beginner's burlap kit for my son! My favorite product in your shop is the embroidered book cover kit. I love you shop - you have such a great variety of products. I love the felt fabric, the cork fabric and your embroidery kits are adorable! I really had a hard time picking a favorite product. Thanks for the chance to win one! Overall I love that you sell a lot of things made of cork, so important in Portugal. I love the kit for the Embroidered book cover even no need sewing. I love the paisley kit! And cork leather? I've never even heard of that! A shop with interesting supplies. Love your shop! Thank you for sharing, I might not have stumbled across it otherwise! I like that you stock kits for different ability levels - some of those kits would be great stocking fillers for Christmas!! 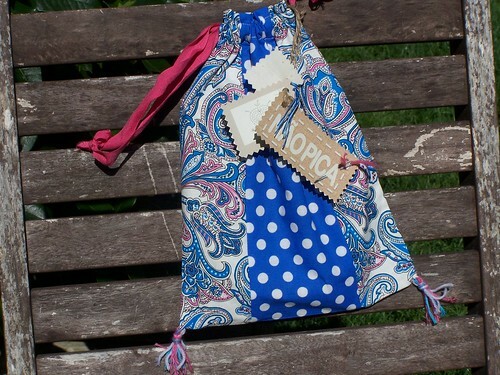 I love the embroidery kit in the blue drawstring bag! I teach a lot of kids English, and I think I'd use such a bag to carry all the books I bring with me to encourage then to read. I think it would be more inspiring to read books from such a pretty bag rather than my boring backpack! Anything to inspire them a bit more to pick up a book!! I love your shop. My hubby and I were in Portugal in Ericeira about 10 years ago. I loved walking around the town and was able to purchase some hand embroidered items. Your shop is reminiscent to me of those items. I love the beautiful colors and shapes. Your shop is truly lovely. Thanks for sharing your love of hand embroidery. oh, I really love your shop ~ and if I have to pick only one thing it would be the book cover ~ it's really lovely! I´ve seen almost these articles and I loved! 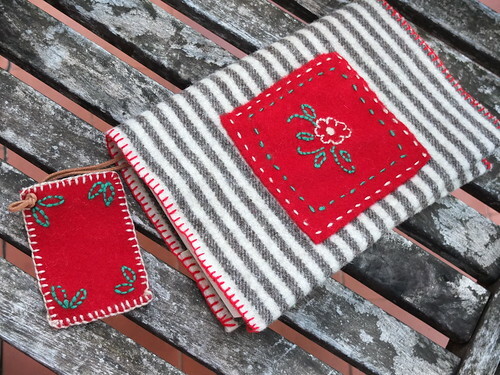 Eu escolho o kit para fazer a coberta do livro (Embroidered book cover kit made of Portuguese felted wool, Christmas gift for her, DIY craft project make your own book cover, no sewing). I love all the cork fabric but of the embroidery kits (which are so pretty!) I love the Portuguese heart embroidery kit. I really love the hibiscus embroidery pattern kit! It is just so beautiful! I like the pre-stamped paisley design on white. I like the hibiscus design, too. Hard to pick a favorite design. This is a great shop! Lots of unique things that you don't see anywhere else. Especially the cork fabric. I'd love to make one of the book covers. Well I missed your birthday so happy late birthday! I think of all the beautiful things I like the Japoneira needlework kit best, I always over embroider things, never know when to stop, so I love the beauty and simplicity of it. Thank you for the giveaway! Hello, and happy birthday! I am always excited to read your posts because I am half Portuguese but do not know very much about that part of my family. I really like the embroidery kit with the heart design. Thank you for showing us so many different things. Hello, and happy birthday! I am not seeing my first post so I am trying again. My favorite is the embroidery heart kit. I enjoy reading your posts. I am half Portuguese but do not know much about that side of my family, so I feel like I am learning more. Thanks for all your posts. the cork beads are my favorite. i think i could make some neat necklaces or bracelets with them. Embroidery kit with hibiscus pattern is the kit I would choose! Its so hard to choose because everything is really neat and colorful in the shop! I love the book cover, but my brain is like, YOU NEED THAT LAP TRAY!! STOP STICKING YOUR NEEDLES IN THE COUCH DUMMY! I love your etsy shop! Portugal is one of my favourite desinations and I have visited several times - we have some good friends in Lisbon! I love the portugese heart embroidery kit in your shop! The thing I love the most about your ETSY shop is the fact that we can choose between your amazing Portuguese products, materials, such as your cork beads and scraps, or your embroidery kits, that allow us to venture in this fantastic world of crafting. 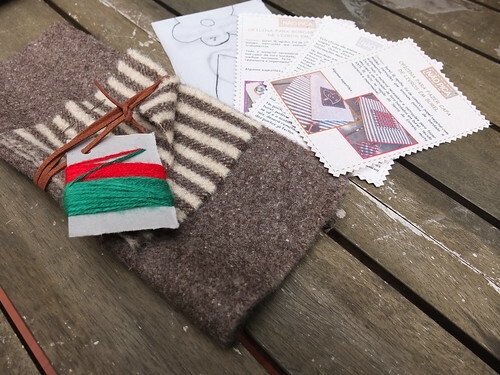 My favourite item at the moment is the embroidered book cover kit made of Portuguese felted wool (http://img1.etsystatic.com/001/0/5718386/il_fullxfull.395518273_4153.jpg). Thank you for the oportunity to be a part of this giveaway! I love the embroidery kit with the hibiscus. There were hibiscus bushes all over the campus of the college I went to and they have been one of my favorite flowers since then. I would love to win the needlework kit with the japoneira pattern! Beautiful Etsy shop! I love the hibiscus kit and the embroidered book cover kit. Really lovely. Thanks for the giveaway! Hi Gabi - I love how you have opened our eyes to Portuguese embroidery. Your shop has things in it that are not available here in the US (at least I've never seen them!). Thank you for teaching us and making these supplies and instructions available! My favorite item in the shop is the Embroidery Kit - Lacing Cards (Thinking of Girls), because I really want to pass on my love of embroidery to my children, and we can learn together how to make our own patterns with cork! I love your kits but even more I love that you offer raw materials special to Portugal. I can't pick between the cork fabric or the burel for a favorite. I love everything with the Portugese Heart design! I love love love your ETSY shop. It gives wonderful insight into Portuguese art life. At the same time, we can use embroidery into our life in different ways such as necklace and book cases which I had never thought of. Very artistic and one of a kind. Love it. What a fun shop you have! I love "all things embroidery" but my heart reaches to the heart embroidery. The color and the fill stitches grab me. I am just teaching my 4 year old granddaughter to embroider. She sits on my lap, and together we stitch in and out with red floss. I know she'd love a kit of her own to make. The cork beads -- love that natural stuff!